With the world’s knowledge at hand, how is it that college applicants and job seekers don’t have the world at their feet? Overuse of technology stunts vocabularies and our ability to tell our stories. Today’s students and young professionals struggle with face-to-face conversation and landing internships and jobs. 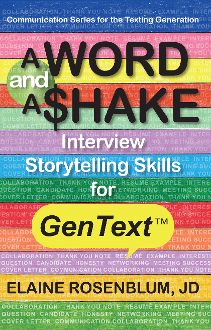 Colleges and employers tell us that GenText™ applicants are challenged by knowledge economy skills—including collaborative communication, writing, and articulation skills. By sharing client stories and lessons from her careers as an entrepreneur, marketer, attorney, and educator, Elaine Rosenblum connects the communication dots in "A Word and a $hake". Students and budding professionals gain valuable insight through the lens of interview and job-search storytelling. "A Word and A $hake" teaches you to own and articulate your skills and point of view, and tell a compelling story to reinforce your message. The deft use of one’s words creates the means for earning a lifetime of respect, being heard, and getting hired. Rosenblum has mentored clients—from GenTexters™ to CEOs—and taught groups of students and professionals to interview, negotiate, and collaboratively communicate in a myriad of settings. Each learns the tests and rewards of face-to-face articulation and self-presentation. Clients land seats in classrooms and at the table, from the Ivy League to the White House. The results speak volumes and have changed conversations and changed lives, one well-articulated word at a time. Often quoted on Forbes.com for her expertise in improving communication in the corporate environment, Elaine Rosenblum is the founder and chief articulation officer of ProForm U® and cofounder of Access Test Prep & Tutoring.